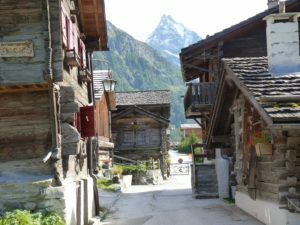 We are located in the small village of Lens in the Canton of Valais, overlooking the impressive Rhône Valley. Situated on a sunny terrace, our chalet is just a five minute walk from the village centre. The village is dominated by the large Catholic Church, and some buildings date from the 14th Century. Besides the amazing views to the front of the chalet we are surrounded by mountains. It takes just 10 minutes to drive to the ski area of Crans Montana. Throughout the summer months there are special events arranged each week. In September the world’s top golfers come here to play in the Omega European Masters Tournament at one of the most beautiful courses in the world. Sion is a 30 minute drive away in the valley. It has a large shopping centre, castles, a Friday market, museums and restaurants. There is also the main line train station for connections to Geneva Airport, Milan Airport and the rest of the Swiss railway network. It is very easy to reach our Chalet by Public Transport. Take the train to Sion then there is a regular bus service to Lens. The bus stop you require is « Lens Poste » and it is about a 5 or 6 minute walk from our Chalet door. Crans Montana is actually 2 towns that have, over the years, merged into 1. There are over 40 restaurants, many shops (everything from Cavier & fine fashions to local cheese and wine shops), a cinema, bowling alley, casino, wellness / spa centres, ice skating rink & swimming pools. During the winter there is plenty to do for both the skier and non skier. We are proud to be members of Tripadvisor. Please click on the link to see the independant review of Crans Montana. If you stay at Chalet des Alpes please take the time to write a review. Chalet des Alpes is approx. 2 hours drive from Geneva Airport. It is approx. 170 km along mostly easy motorway driving. Only the last 15 / 20 minutes is up the mountain but this is still a good road.